MySQL Connector/ODBC requires Microsoft Visual C++ 2010 redistributable so you have to install it first. If you want to install MySQL Connector/ODBC 32-bit version, you have to download and install Microsoft Visual C++ 2010 Redistributable Package (x86). If you want to install MySQL Connector/ODBC 64-bit version, you have to download and install Microsoft Visual C++ 2010 Redistributable Package (x64). 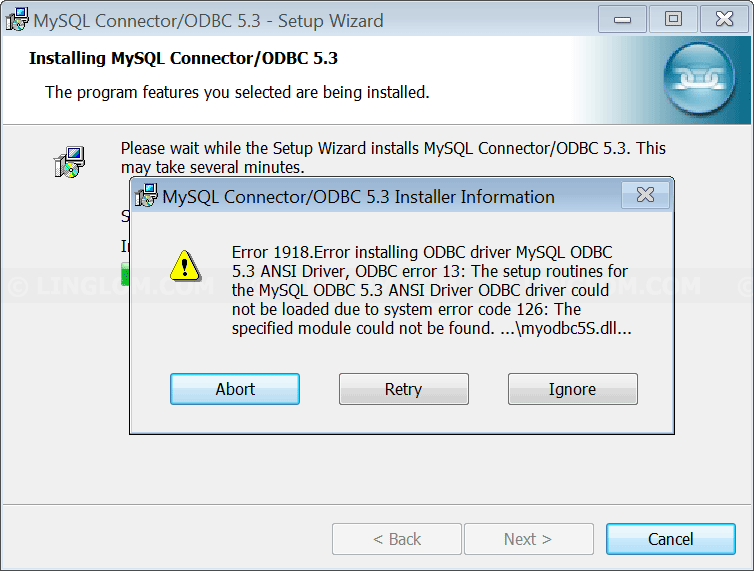 After you installed Microsoft Visual C++ 2010 redistributable, you can try reinstall MySQL Connector/ODBC again, the issue should be resolved this time. For me, I am installing mysql-connector-odbc-5.3.6-win32.msi, Microsoft Visual C++ 2010 Redistributable Package (x86) doesnâ€™t work for me. However Visual C++ Redistributable Packages for Visual Studio 2013 works. Doesn’t work. Even on a clean install. 3/4 of my machines, I cannot install the connector. They all have that VC pack installed. Is the error message exactly as described in the post? Have you tried to install both versions of VC++? What are the versions of Windows and connector/ODBC that you having problem? Maybe I could replicate error in my environment to help you. I already did your suggestion but it didn’t work with mine as well. Can you suggest another solution. the Version I tried to install is 5.1.11. If one of these files are read-only, try to remove read-only attribute out from the file. And try to re-install VC++ again. * It is recommended to backup these files before re-install in case you may need it back. I had the same problem and I was using windows vista 64 bit version and for some reason the installation file for MySQL ODBC Driver on Window was keep coming with an error that appears above. I then decided to Google for a solution, this first I was enter on the web form and i have manage to get solution to my problem. Basically what I figure out was, the problem with installation is that the originally installation file require another components to be installed first before you can processed with the MySQL ODBC Driver installation for windows. The Installation file that requires for MySQL ODBC Driver on Window 32 /64 is Microsoft Visual C++ 2010 Redistributable Package (x86) for 32 bits or Microsoft Visual C++ 2010 Redistributable Package (x64) for 64 bits. I am having the same problem, and the solution described here doesn’t help. I am unable to install either the 32 or 64 bit C++ Redistributable Package. The error message says that I already have a newer version installed. I don’t want to downgrade the redistributable. I suggest you try to uninstall MS Visual C++ 2010 redistributable that you have. And reinstall with the new one that download from Microsoft. None of this works. I install the C++ package, and I still get that error. Update: ODBC connector version 5.2.7 works. For me, I am installing mysql-connector-odbc-5.3.6-win32.msi, Microsoft Visual C++ 2010 Redistributable Package (x86) doesn’t work for me. However Visual C++ Redistributable Packages for Visual Studio 2013 works. Thanks VCD, your link also solved my Problem, because the other Visual Studio Redistributable Packes version was to old! I installed the 32-bit version of the MySQL ODBC connector, and the installation completed seamlessly. Hi, I followed “Nidelson G” suggestion to install VS 2013 and it worked. Thanks! I already had the Visual C++ Redistributable installed. I checked the attributes of the 4 dll files that linglom suggested, but none were set to readonly. I tried everything I could think of, including uninstalling everything on my computer related to MySQL, cleaning all MySQL references from the computer registry, etc. I figured, what the heck. Downloaded 5.2.7, ran the install, and it installed the first time without a single blip. Nidelson Gimenes comments worked for me too. thanks VCD. VS 2013 worked. Gracias a VC++ 13 x86 redistribuible con el 10 no funciona. Mil gracias. Basically works but not as specified. Yes, the problem is the lack of the VC++ redistributable. I downloaded and installed the files for the 2015, 2013 and 2012 versions (not sure which one did the trick, but I suspect it was the 2015, the latest available). I installed both x86 and x64 components and was then able to successfully install ODBC 5.3.7, both 32 and 64 bit drivers. VCD you are my best friend!!! I had VC++ Redist 2010 installed, but i still couldn’t install MySQL ODBC driver. (i use Windows 2012 and mysql-connector-odbc-5.3.9-winx64). So VCD’s solution helped me. Installing Visual C++ Redistributable Packages for Visual Studio 2013 worked for me too before installing mysql-connector-odbc-5.3.9-win32.msi. I have to use the 32 bit version because Endicia Mail Service doesn’t support the 64 bit version. Thaks you!!! your’e the best! Hi, I install VS 2013 and it worked. Tks! Asad, you post same solution as OP, which did not work. VCD- your’s works. Thank you.